By the time we’re through to the end of the stanza, we’re not just on a physical journey together — we’ve entered into a kind of community over time, bound to the distant past and the future. As we read on, it becomes clear that we are bound in this community less by the experience of a shared journey than by the experience of common texts or stories. Michael Palmer has said that to read Norman Finkelstein’s book Scribe “is to pass through a series of gates into the paradoxical heart of the poem,” where “the communal and the solitary” come together in the music of the poetry. He’s on to something, I think: what strikes one most strongly in Scribe are the repeated invocations of communal experience, and the ways the influence on collectivity works its way into the forms, as well as the subjects, of the poetry. with the ox and the pit, the destruction and the fire. long ago and yesterday and the day after tomorrow. teach this book and all his order to the others. What we’re seeing, here, is nothing less than the evolution of the Torah — the five books of Moses — and the Mishnah, or Shisha Sedarim, the six orders into which the oral version of the Torah was first edited and compiled. This compiling, of course, opened up the long, ongoing tradition of commentary, redaction, and interpretation that binds the Jewish people together, through dispersal over space and time, as a people of the book. so it might return to the sea. What’s valued are the transformations, metamorphoses, and miraculous recontextualizations of a tradition as it travels through time. The proliferation of interpretations and the evolution of reconfigured texts aren’t sources of conflict, in this view: they are signs of a living tradition, and a rich, collective conversation. a scribe turned into a scribe. In these lines Finkelstein draws our attention to our distance from the people who first experienced the events recounted in the Old Testament: we cannot enter into the consciousness of pre-modern prophets any more than they could enter into the scientific consciousness of an archaeologist, even though both types of person are concerned with the same tradition. But he also draws our attention to our continuity with the past, to the modern persistence of the role of scribe as preserver, commentator, and re-arranger of traditional text. In the end, we share an identity with the past, even as we are distanced from it. I don’t know what’s more resonant here, the line “The way to language,” which brings to mind the title of Heidegger’s Unterwegs zur Sprache, or the image of the “Yellow Stars/In a black forest,” a haunting double-vision of the symbol the Nazis forced Jews to wear, and of the Black Forest near Heidegger‘s hut at Todnauberg. 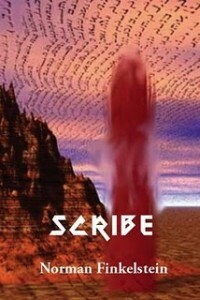 The third and longest part of Scribe consists of poems that quote from, and riff on, passages from architect Christopher Alexander’s famous book on traditional design, A Pattern Language. Alexander’s book, a richly illustrated guide to small and large architecture and based on medieval models, begins with the premise that environment and community form the basis of enduring design. We can see why Alexander’s book has such appeal for Finkelstein: for both men, the emphasis is on collective life. As Finkelstein says in an endnote to the book, he was first drawn to A Pattern Language because of that book’s “idea of community,” of architecture as an art of the social world. Many of the poems discuss the idea of community in urban and domestic spaces, but it is at the level of form that ideas of community and collective creativity come into full flower: the poems read less as Finkelstein’s private thoughts than as a series of annotations and elaborations on substantial quotations from Alexander’s writing. The feeling one gets is akin to that of reading scribal commentaries on a traditional text: there is a kind of collaboration at work, as a source text is elaborated and grows in meaning. There are many versions of the poet-as-professor in the highly academicized world of contemporary American poetry: the poet-professor as hidebound formalist, the poet-professor as follower of intellectual fads and trends, and the poet-professor as obscurantist, to name just a few. In Norman Finkelstein, we’re lucky to have one of the oldest kinds of academic: Finkelstein is a scribe.